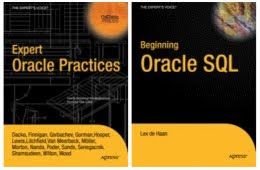 The first book is entitled Expert Oracle Practices: Oracle Database Administration from the Oak Table and it will be officially published in December. There are 9 chapters currently available for eBook download via the Apress Alpha program. The Alpha program allows you to purchase (at a substantial discount from the full publish price) an unedited, unfinished pre-release format. The full book isn't available yet, but when it becomes available, you will be able to download the full eBook at no additional cost. It's a good option if you want to get a jump on what's to come! I wrote the chapter on Managing SQL Performance. I'm really excited about the book and am very proud to be among the group of Oak Table folks who are co-authoring it together. Not far behind the Oak Table book will be Beginning Oracle SQL. The book is a revision of the classic Mastering Oracle SQL and SQL*Plus by Lex de Haan originally published in 2004. Again, I was fortunate to be able to work with a fantastic group of co-authors to revise Lex's work to include many of Oracle's latest developments to the SQL query language. I knew Lex for only a very short time before his passing in 2006 but I knew him to be a brilliant and wonderful man and I'm very honored to be able to contribute to revising his original work. These books represent my first time as a published author. I've written many whitepapers and articles for various Oracle user group periodicals and such in the past but never attempted the process of writing a book. After having this experience, I'm grateful that my first time was as a co-author. It's comforting to know there are other folks out there sweating the process with you! The folks at Apress have been awesome and I hope that my first experience as an author won't be my last!